Learning when to harvest beets takes a little knowledge of the crop and understanding the use you have planned for the beets. Harvesting beets is possible as soon as 45 days after planting seeds of some varieties. Some say the smaller the beet, the more flavorful, while other allow them to reach a medium size before picking beets. Picking the leaves for use in various culinary endeavors is also a part of harvesting beets. 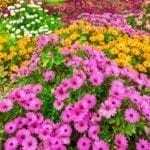 The attractive leaves are packed with nutrition and may be eaten raw, cooked or used as a garnish. Making juice may be a part of your plan when harvesting beets. Picking beets is easy once you know what to look for. Shoulders of the beets will protrude from the soil. When to harvest beets depends on the size of beet you desire. The best beets are dark in color, with a smooth surface. Smaller beets are most flavorful. Larger beets may become fibrous, soft or wrinkled. 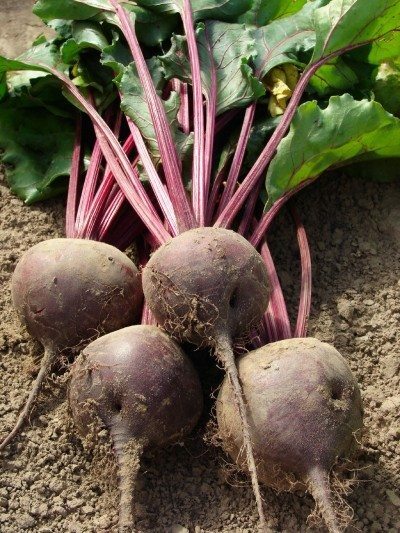 The time table for harvesting beets will depend on when the beets were planted, temperatures where the beets are growing and what you are looking for in your beet crop. Beets are best grown as a cool season crop, in spring and fall in most areas. Depending on soil and recent rainfall, you may want to water the beet crop a day or two before picking beets to make them slip from the soil more easily. This is particularly true if you will be picking beets by hand. To harvest beets by hand, firmly grasp the area where the leaves meet the beet root and give a firm and steady pull until the beet root comes out of the ground. Digging is an alternative way of harvesting beets. Carefully dig around and below the growing beet, being careful not to slice through and then lift them out of the ground. After picking beets, wash them if they will soon be used. If beets will be stored for a length of time, place them in a dry, shady place until the soil on them has dried, then gently brush the dried soil off. Wash the beets right before using. Beet greens can be sparingly and individually trimmed from the root while the roots are still in the ground, or can be cut off the beet root in a bunch after the beet has been harvested. These simple steps to harvest beets are all that is required to take this vegetable from the garden to the table, stove or storage area. 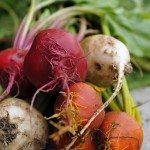 Have a plan for the beet harvest, as beet greens will last only a few days when refrigerated and beet roots only a few weeks unless stored in sand or sawdust in a cool place, such as a root cellar. When picking beets, try to eat some of them fresh for the best flavor and highest nutritional content.